This Siomai recipe uses typical Filipino dumpling ingredients such as ground pork, shrimps and spring onions and wrapped on wonton wrappers. 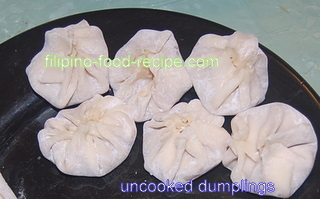 Dumplings are usually of Chinese origin, served on bamboo steamers at dim sums, alongside siopao (steamed bun), congee (arroz caldo) and chicken and duck feet. Interestingly, almost every culture has their own version of dumpling. The Italian's raviolis, the Polish's pierogie, the Korean's mandu and the Japanese's gyoza, are among the few dumpling variations of different countries. Though for most Filipinos I know, they enjoy Siomai at Foodcourts at the mall or as snacks with a Soy Sauce/Calamansi or Lemon Juice (Toyomansi) dipping sauce. And still, others cook them onto a soup to make Pancit Molo. 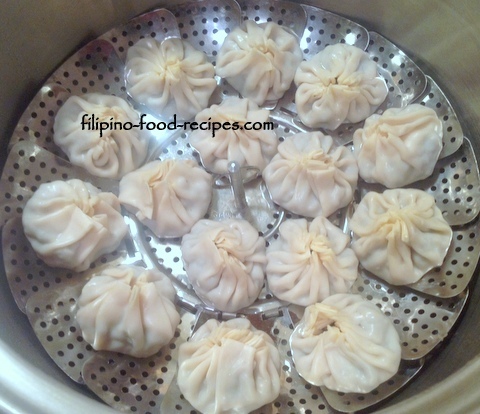 You can basically use your imagination as to the filling you want to put in your Dumpling. If you are in for a healthy alternative, use vegetables with Tofu. Potstickers, or how dumplings are popularly called around here are oval shaped, crimped and pleated on the top edges. They are first fried with very little oil to make them stick to the pan. Little water is added, then topped with lid. Once all the water evaporated, the dumplings are cooked. Only one side of the dumpling is golden brown. 1 Mix together all the ingredients, except the first two. 2 Scoop a tablespoon on each wrapper and form according to your preference. 3 Seal by brushing egg on the outer side of the wrapper. 4 Arrange onto a steamer and steam for 30 minutes. 5 Serve as is or cook further by deep frying. 6 Serve with Soy Sauce and Calamansi Juice or your favorite dipping sauce. The egg and breadcrumbs act as binders so the meat filling will not fall apart once cooked. Hide the vegetables you want your kids to eat in the filling. Use the green onion stalks instead of the leaves so they will not see green and think they are eating vegetables. Add 1/2 cup water slowly, then a tablespoon at a time(up to 3/4 to a cup) until the dough becomes one big mass and collecting on one side of the processor. - Transfer on a floured board and knead until smooth, then form into small balls. Make sure to cover them with damp cloth so they don't dry out. Rest for few minutes for easy handling. - Flatten each ball and they're ready to be filled with your favorite filling.